StrongVPN history is dated back in 90s when a small Californian web hosting company Reliablehosting.com has decided diversify its business. They started VPN as an additional service for their customers. 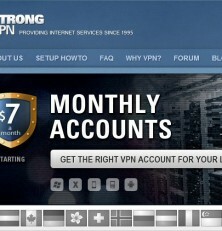 Meanwhile, as VPN industry has grown up, the Reliablehosting.com singled out StrongVPN as a separate business. Today StrongVPN has an impressive pool of several hundred servers in their network around the world and automatically IP address distribution gateways to prevent servers overloading. Moreover, StrongVPN features an extensive range of pricing plans supported by dedicated team of more than 40 technicians and consultants speaking wide variety of languages. 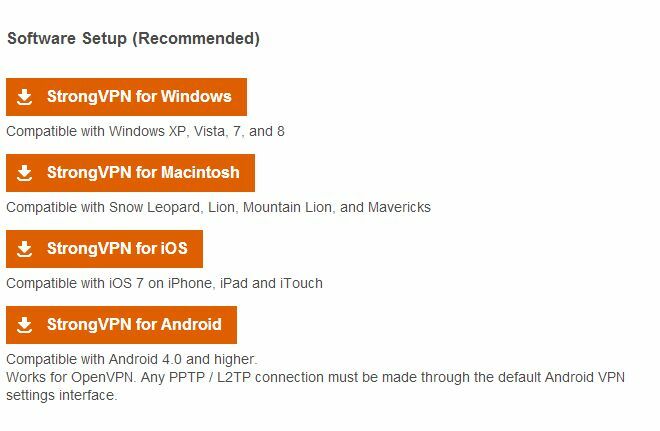 StrongVPN supports Windows, Mac OS, iOS, Android, Linux, Ubuntu, Bada, HP WebOS and Symbian operating systems. It even can be installed on Wi-Fi routers with DD-WRT or TomatoUSB firmware. Microsoft Windows: Windows XP, Windows 7, Windows Vista, Windows 8, Windows 8.1 and Windows RT are supported. Mac OS: All Mac OS versions are supported via Tunnelblick. iOS: You will get a VPN configuration file that you can even email yourself on other Apple devices. Alternatively you can create a VPN profile and enter all the necessary configuration settings manually. Android: All known Android devices are supported. However, there is no StrongVPN application to install. The installation is made in three steps: first of all, you will have to download the configuration file from “Customer Area”. Then you have to look for OpenVPN client application in Google Play store, download and install it. When done you have launch OpenVPN on your Android device and load StrongVPN configuration file. Wi-Fi Routers: Installing VPN on your router is most convenient way to use all the advantages of VPN. Just imagine all of your devices, computers, TVs, PlayStations, Xboxes, Media Players are sharing the same secure connection with the IP address of your choice. It gives you the ability to watch Netflix or Hulu on your SmartTV, e.g., without connecting it to a computer. The disadvantages of such an approach are relativity higher price ($85 against regular $55) you will pay for StrongVPN and somewhat tricky way to install it on your router. So yes, you will need to buy another one Wi-Fi router for this. Due to these facts, StrongVPN offers preprogrammed Wi-Fi routers for a wide variety of prices: from $99 to $299 (plus $85/year). It is convenient plug-n-play solution; however, it’s far not a cheap one. StrongVPN has industry widest range of available devices and operating systems to install to. Unfortunately, it is being compensated by higher prices and complexity of the installation process. StrongVPN has no free trial; however, you may take advantage of their refund policy: if you are not satisfied with StrongVPN you are eligible to get your money back within 7 days. Lite PPTP plans: WWith Lite PPTP, you will get a fast connection with limited security and high level of ruptures. The servers selection will also be limited to PPTP ones located in USA only. It will cost you $21 per 3 months, $40 per six months or $75 per year on your choice. Standart PPTP plans: With these plans ranging from $36 to $100, you will get everything Lite PPTP plan has plus more servers to select (still within USA only). Deluxe PPTP plans: With Deluxe PPTP plan, you will have an access to the wide range of StrongVPN PPTP servers in 18 countries for $45 per three months, $85 for 6 months or $155 per annum on your choice. Special PPTP plan: With Special PPTP plan, you will get the discounted version of Lite PPTP yearly plan for as low as $55 against regular $75 price. Lite/Starndart/Deluxe and Special Open plans: These plans are analogues of appropriate PPTP plans with one exception: they are based on OpenVPN, not PPTP connection. They are much more expensive then PPTP ones: you will have to pay $30, $57 and $90 for Lite plans of three, six and twelve months accordingly. Standard Open plans will cost you $45, $85 and $155, while Deluxe ones – $60, $144 and $210. OpenVPN plans allow you to use wider range of devices, use stronger 2014-bits encryption, overcome government firewalls and make you able to connect both PPTP and OpenVPN servers thus widening range of available servers. Moreover, OpenVPN provide more stable connection with minimum interruptions. Premium PPTP and Open plans: These are most expensive plans that will cost you $30 per month with no special annual offer. You will get the access to all StrongVPN servers anytime with PPTP or OpenVPN on your choice..
You can pay for StrongVPN via PayPal, Wire Bank Transfer, Western Union Money Transfer, eChecks, Stripe (for USA, Canada, UK, Republic of Ireland only) and even Bitcoins. StrongVPN offers 7 Day Money Back Guarantee, which make it quite convenient solution for testing purposes before making the final decision. You will have a choice from more than 200 servers in 6 USA cities for Lite and Standard PPTP plans; and more than 300 servers for Lite and Standard Open plans. Deluxe plans feature more than 400 servers in 19 countries. Assuming that each server contains hundreds of IP addresses, it makes StrongVPN IP addresses pool one of the largest in industry. However, as for customers, the numbers of switches between servers and IP addresses is strictly capped from 15 to 30 per month depending on selected plan. StrongVPN will assign you the IP addresses in random manner, recombining them every 24 hours.. Both StrongVPN PPTP and OpenVPN connections have no bandwidth limitations, no matter what plan you are subscribed to. To say the truth, User Interface is not a strong suit of StrongVPN. You need to have some basic technical knowledge to set it up. Fortunately, StrongVPN has very helpful customer support available 24/7. We have purchased one PPTP and one OpenVPN plans for testing purposes. Three 24h PPTP sessions resulted in 35 “connection lost” messages, while OpenVPN have reconnected four times only in similar conditions. StrongVPN gets 3.5 out of 5.0 for connection stability. StrongVPN official website contains useful information on how server selection affects your VPN connection speed. We have followed their guidance and connected our European server with StrongVPN server located in NY, our Canadian server located in Vancouver with StrongVPN server in Seattle, while our NZ server was connected to server in Los Angeles. After running 24 independent tests for each server every hour, we have come to the conclusion that StrongVPN connection speed for PPTP averages at 7.1 Mbps, while OpenVPN at 6.4 Mbps. So, as you can see, the connection speed is outstanding and corresponds to the cost of the VPN service. When it comes to customer support, StrongVPN has to offer the best customer assistance in the industry. More than forty technicians, support specialists and support supervisors are ready to serve you 24 hours per day and 7 days per week. You can submit a ticket, have a live chat online and even have Skype or regular phone conversation. Moreover, you are able to find out when a particular assistance staff member becomes online to ask him for help. We have a pleasant phone conversation with Svetlana about how StrongVPN recurrent payments works and we have talked about how to setup StrongVPN on our router with Elmer all of them were very helpful and professional. StrongVPN is an expensive solution for those who know very well what they want and ready to pay for much tailored solution twice more than the industry average. It is probably the best solution for experienced users who had tried some other VPN services before and finally stopped on StrongVPN for some very particular reason. StrongVPN also suits the needs of those who are trying to access some web content from countries where governments have restricted the access to some USA video services and social networks and other VPNs are not able to overcome a national Firewall.